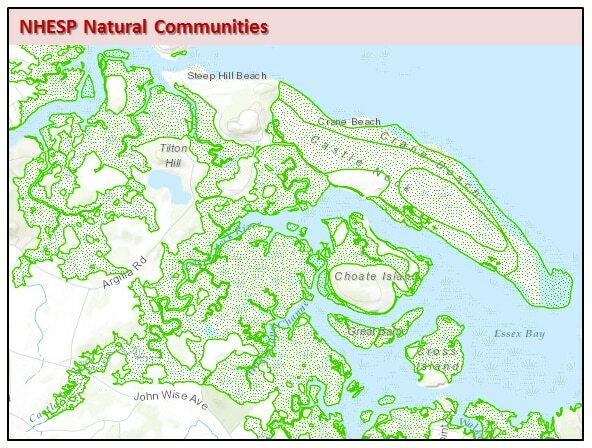 The NHESP Natural Communities datalayer consists of polygons that represent the extent of various natural communities of biodiversity conservation interest in Massachusetts. The NHESP Natural Communities datalayer consists of polygons that represent the extent of various natural communities of biodiversity conservation interest in Massachusetts. These polygons are based on records of natural communities maintained in the Natural Heritage & Endangered Species Program (NHESP) database. Program scientists classify and delineate natural community polygons by analyzing field data collected on-the-ground and available information about the landscape (particularly topographic maps and aerial photographs). All sites in the NHESP database have been visited by NHESP biologists or by other biologists who have submitted reports on community occurrences that NHESP biologists have reviewed and accepted. Aquatic community types are not included. The polygons are spatially represented at 1:25,000 or 1:24,000. The natural community types are from Swain, P.C. 2016. Classification of the Natural Communities of Massachusetts, Version 2.0. Natural Heritage & Endangered Species Program. The classification is available from NHESP. The classification names and describes 107 types of natural communities found in Massachusetts. The datalayer is based on information on natural communities determined by NHESP to be of biodiversity conservation importance on a statewide basis. It is not intended to be part of a comprehensive vegetation map of the state. Not all the named types are actively tracked by NHESP; NHESP’s focus is on the least common types and those for which Massachusetts has a significant part of the regional or global occurrences. Additional verified natural community occurrences received during and after the preparation of this datalayer will be included in future iterations of the datalayer. The datalayer contains 952 records of natural communities from the NHESP database. These include 97 community types, of which 73 are Priority for conservation (ranked S1 through S3S4) and 24 types are more common or Low-priority for conservation (S4 and S5), with the included examples considered to be in Exemplary condition. Please note that a very few occurrences of natural communities in the NHESP database are not included in this public datalayer due to either the sensitivity of the sites, or they are too degraded or small to be considered viable examples of the Priority types or they are non-exemplary examples of the more common, Low Priority for conservation types. These polygons are not related to "Priority Habitat" or "Significant Habitat" as defined by the regulations of the Massachusetts Endangered Species Act (MESA). Natural Communities are not protected under the Massachusetts Endangered Species Act, the but the rare species that may occur within some of these natural communities are protected by that law. In ArcSDE the layer is named NATCOMM_POLY. This datalayer was digitized primarily by NHESP scientists, usually through heads-up digitizing by the scientists themselves. Whenever possible, polygons were digitized to correspond to base features in the most recent MassGIS orthophotos at the time in which the natural communities were being entered into the NHESP database; usually all available orthophotos and the digital topographic quadrangles were consulted. 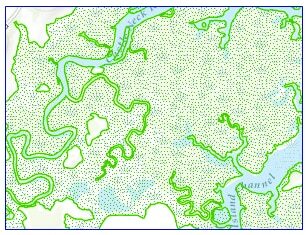 Many of the wetland polygons are from the data available from MassGIS (although these polygons were then occasionally altered by on-the-ground knowledge of the site or to match the current orthophoto). Other base features used in determining boundaries included hydrography and elevation. Polygons for some records were initially drawn on paper 1:25,000 USGS topographic maps. When heads-up digitizing was used, polygons were digitized to a scale of 1:25,000 or larger (i.e. 1: 5,000). In most recent instances, GPS point locations were used as a reference when digitizing natural community polygons. For some community occurrences in eastern Massachusetts there was overlap between the communities for which NHESP has on-the-ground information and those identified in MassGIS’ Priority Natural Vegetation Communities April 2003 datalayer. The community boundaries as identified by MassGIS’s aerial interpreter have been used if there were questions about the extent of the occurrence. For example, NHESP has data that an Inland Atlantic White Cedar Swamp community exists in the Hockomock Swamp, but the actual boundaries within the wetland were not established by the field work. Polygons showing the boundaries of the community type in the Priority Natural Vegetation Communities datalayer do delineate that specific community occurrence, and so were adopted as the NHESP polygon boundaries, as well. Several types of the “vegetation communities” include multiple types of NHESP natural communities which are difficult to differentiate without on-the-ground species occurrence information. UNIQUE_ID This reference number provides a unique identifier for each polygon. COMMUN_NAM The official name of the type of natural community as described in the Classification of the Natural Communities of Massachusetts Vers 2.0 (Swain 2016). S1 Typically 5 or fewer occurrences, very few remaining individuals, acres, or miles of stream or especially vulnerable to extirpation in Massachusetts for other reasons. S2 Typically 6 - 20 occurrences, few remaining individuals, acres, or miles of stream or very vulnerable to extirpation in Massachusetts for other reasons. S3 Typically 21 - 100 occurrences, limited acreage, or miles of stream in Massachusetts. S4 Apparently secure in Massachusetts. SPECIFIC_D A brief statement on the specific occurrence of the community type represented by the polygon associated with the attribute table. COMMUN_DES A brief, general description of the natural community type. VERSION Year in which the datalayer was last edited. Please note that NHESP Natural Community polygons were designed for use at a regional or town scale. For accurate portrayal, the data should be displayed at scales of equal to or less than 1:25,000 (e.g., 1:30,000). This datalayer is intended for conservation planning purposes only. It is NOT intended to be used for regulatory purposes. Other NHESP layers - Priority Habitats of Rare Species and Estimated Habitats of Wetland Wildlife - are designed for regulatory use. They are produced in the Natural Heritage Atlas, and are available from MassGIS at Priority Habitats of rare Species and Estimated Habitats of Rare Wildlife. The NHESP database is continuously updated as occurrence records are added, modified or deleted. Those changes will be incorporated into the natural community GIS datalayer periodically, with a date in the public datalayer name indicating the most recent version. Questions about biological aspects of the NHESP Natural Communities datalayer should be directed to NHESP at 508-389-6360.